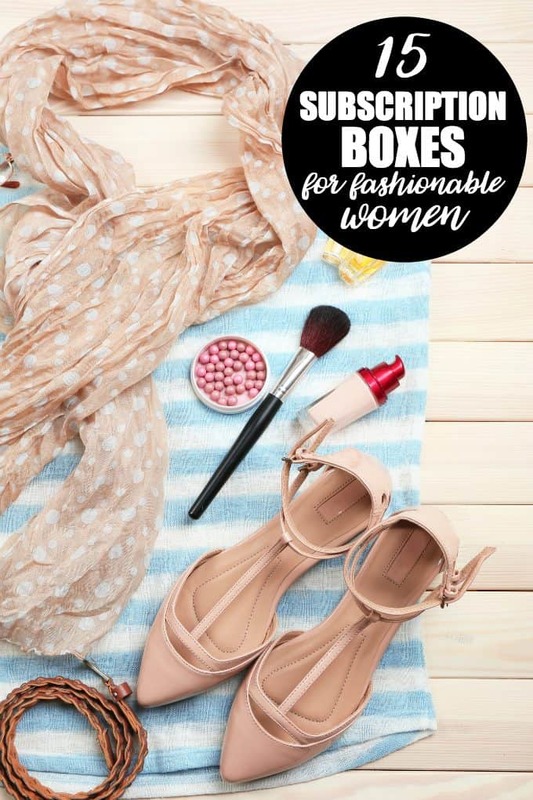 If you’re into fashion, you’ll love these subscription boxes for fashionable women! Each box is a little different, so be sure to check them all out. 1. Box of Style is a fashionable subscription box that is shipped out by season, instead of each month. Each box is filled with fashion, beauty, and lifestyle items to match the current season. Box of Style features established artists as well as up and coming fashion designers, to provide on-trend pieces with every delivery! 2. Your Bijoux Box is “sparkle delivered, yours to keep”! Items are mostly jewelry, some beauty. I love that they show exactly what was in previous boxes so you get a good idea of what kind of items to expect in your monthly subscription box. 3. Little Lace Box is “a box of happy discoveries” which means you’ll get amazing, high-quality, unique products shipped to your doorstep each month when you subscribe. Be the first to sample their luxurious and coveted fashion items (some not seen in stores yet!). 4. Emma & Chloe is a jewelry subscription box. Each month, you’ll get a new piece of unique jewelry to add to your collection! 5. Gift Izzy, a luxury boutique in a box, is one of those fashion subscription boxes you will really want to try after seeing all of the items others have shared! It’s a bi-monthly shipment, featuring limited edition handmade accessories with European designers. Each box contains 3-4 lifestyle, beauty, and accessory luxuries worth $200! 6. Le Tote intrigued me because it’s a fashion rental subscription box. Le Tote recommends pieces you’ll love and delivers a customized box of fashion to your doorstep each month. Fashion items are for work, weekend, and everything in between. 7. Cate and Chloe brings sparkle to your life with a VIP Jewelry Subscription Box at an affordable price. You’ll receive pieces based on your own personal style, plus a special gift in every delivery. Cate and Chloe offer VIP discounts on other items, and free and easy exchanges if the need arises. 8. Dollar LuLaRoe Club is exactly what it sounds like: LuLaRoe leggings shipped to your doorstep each month! Available in One Size and Tall & Curvy. Choose solid or print at checkout. 9. Enjoy Leggings is an affordable monthly subscription box that features great quality, super soft leggings. All of the reviews are 5 star, too! 10. Threads helps you stay up to date on the latest fashion trends with fashionable clothing and accessories hand-picked just for you, delivered right to your doorstep each month! 11. Gina Louise Bling Box is an eco-friendly jewelry surprise box. This subscription box is different as it comes shipped in a plain shipping bag, and jewelry is in a gift bag. Each surprise box includes 3-5 accessories and fashion items like necklaces, rings, and scarves. The boxes are valued at $75+ for just a fraction of the cost. 12. Hanee21 sends you four boutique-style fashion items each month, plus you get free shipping. Log in to pick your style, colors, and size, and your hand-picked items will start flowing in. 13. Ivory Clasp is a women’s handbag subscription box. Each handbag is valued at $100+ for a fraction of the cost. One of the reviews said the bag she received was $148! I can’t be the only one who gets excited of the thought of a new purse arriving on my doorstep each month. 14. Chic StyleBox sends out 2-4 accessories each month, featuring unique pieces of clothing and cosmetics to go along with the accessories. 15. Wantable helps you build a better wardrobe with assistance from your personal stylist. Take a quick style quiz, then receive an assortment of hand-picked items just for you. Keep what you love, return what you don’t. **New** FabFitFun sends out a huge box of beauty, wellness and fashion accessories each season! Use the coupon code FIRSTBOX to save $10. There are so many options for fashionable subscription boxes! Now I just have to decide which one to try first. Check out my other posts about subscription boxes! I think this year I will be giving box subscriptions as gifts to family and friends! They are a really cute idea!